Just because you have hit the big 40 or even surpassed it, that doesn’t mean your days of grand adventure are over. You and your spouse can still plan extremely active and energizing dates that are sure to thrill you to your cores. Planning an adventure date might be a little bit different than your average run of the mill Friday night, so be prepared to invest a little time in the design. Then head out and play hard! 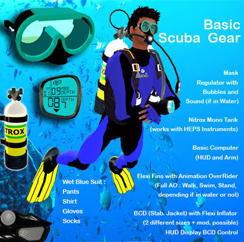 Scuba Diving– You can sign up for classes, join a club, or go on an organized dive if you’re already scuba certified. There are also opportunities for great white experiences. You can learn about those adventurous dives here. Helicopter Rides– You could tour the city with views unlike any you’ve had before. Take cameras to help commemorate this remarkable trip. Skydive– If you have never been, then try a tandem jump with an instructor. Otherwise plan to jump somewhere new, and if you’re really good, have a picnic set up where you’ll land. To learn more about skydiving read this. Spelunking– Cave exploration is called spelunking. Enjoy an afternoon of exploration but make sure to go with the proper equipment. Breakfast– Well, more than that. Get up early and go hiking, to the beach, or to the riverside. Bring everything necessary to cook breakfast over a campfire. Bring your lunch too so that you can fully enjoy your time in the wilderness. Motorcycle– Learn to ride together if you don’t already know. Then take a motorcycle ride to your favorite picnic spot and stop for lunch. The wind in her hair is sure to inspire you. Treehouse– Build it together. Then make it your secret rendezvous whenever times get too stressful or you just need a night out. Check out these incredible treehouse designs. Some of them are like homes away from home. Hot Air Balloon– You can find these companies all over the country. Based on your time frame you can add a number of different additional options to this adventure. You could make food, or fun, part of the plan. Maybe even enjoy some skiing wherever you land. Hiking– Go exploring by hiking up a mountain or park trails. Just make sure it’s somewhere you have never been. And then go well prepared to stop for lunch and enjoy the scenery. Travel– Travel is always an adventure and given the vast array of places you can traverse, planning a vacation to an area with a rain forest, or gorgeous waterfalls and private springs, is a marvelous idea. If you need great vacation destinations for couples you should definitely click this. The bottom line here is based on how valuable your spouse is to you. If she’s worth the world to you then you should show her the world, shimmering, shining, and splendid. Because, seriously, when did you last let your heart decide? Adventure dates for 40 somethings are worth your time and investment.